It's raining here again in the Bay Area all weekend long. It feels like we haven't had a dry weekend since October. 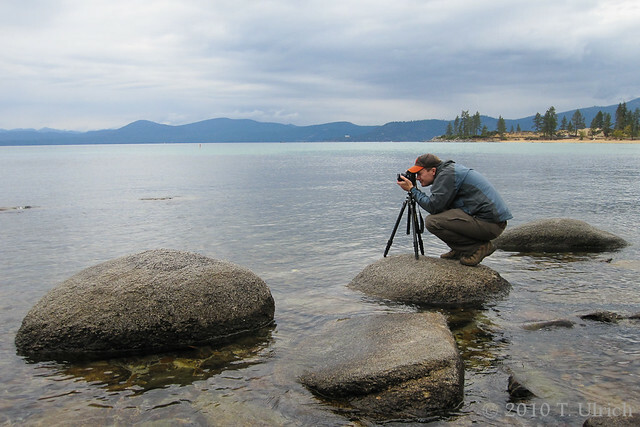 Its definitely a bummer to be stuck inside again, so in honor of the dreary weather outside, here's a shot from a rainy trip around Lake Tahoe. 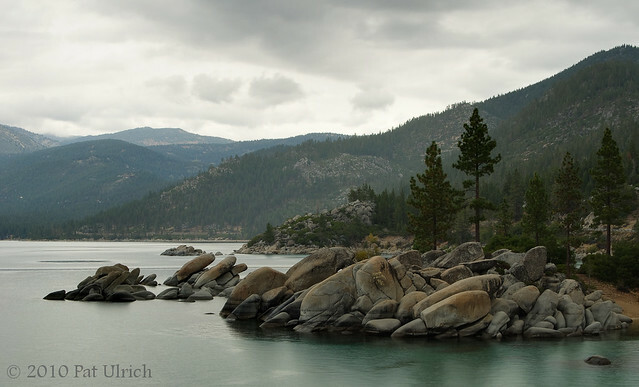 This is an HDR blend of multiple exposures from the Sand Harbor area of Lake Tahoe on the Nevada side. 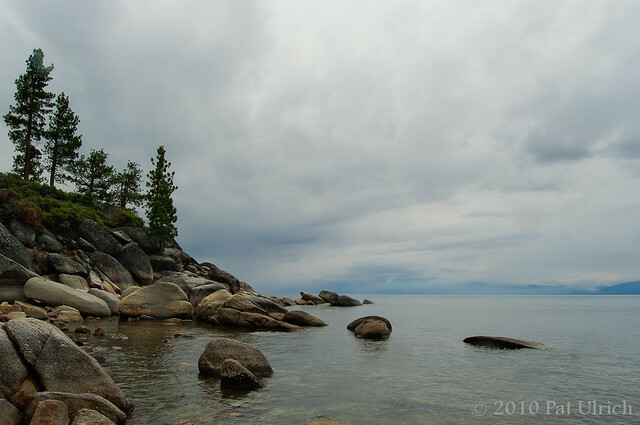 The storm clouds passing through complement the cold colors of the large boulders that surround the lake. And an extra special thanks to my wife, who was holding the umbrella over me and the camera for these shots! Our trip to Lake Tahoe in October wasn't all bears and salmon, as we took a drive around the lake on Sunday afternoon. It was unfortunately a rainy day, but we did get periods of time without precipitation, which provided a chance to shoot some landscapes with a wonderfully dramatic sky. 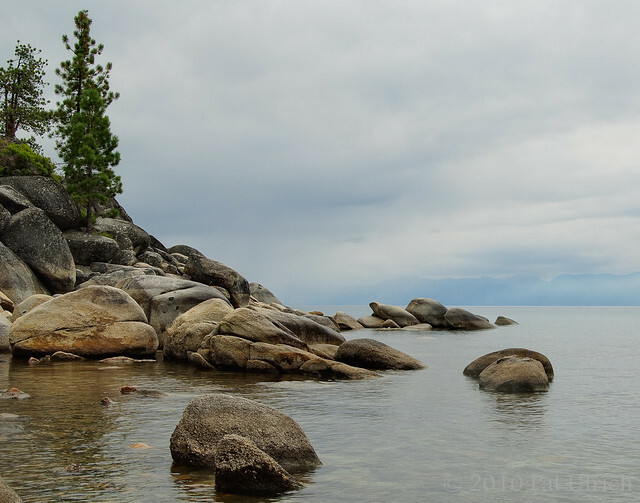 This shot is from the Sand Harbor area on the Nevada side of the lake during a mostly dry walk along the shore. Since the sky had such wonderful color but was rather bright, I thought this would be a good chance to take some bracketed sets and try my hand at HDR for the first time. This is a combination of 3 frames, each one stop apart. I'm not sure that this was the most ideal situation for requiring a blended exposure, but compared to what I was able to do in a single frame in Lightroom it did seem to help a bit. I was able to retain more of the color in the sky, while still keeping the rocks evenly lit in the foreground. This is definitely something I need some work with, but it was a fun exercise all the same. I've included a "making of" shot, courtesty of my lovely wife, since she takes such great pictures of me taking pictures. I had to laugh when I saw this one too, because I know she was chuckling at me during this shot since I had just explained how I would need to go to the furthest rock I could reach in order to get just the right composition. Of course, when I compare the results of my HDR efforts to what came out of my wife's point and shoot in auto mode, perhaps it wasn't worth the trouble!